We are giving out 10 FREE Games on Jungle Jim – El Dorado to selected players who review our iOS casino app. If you’re reading this, you are one of the chosen few! Login to this page and enter the nickname you used when leaving the review. 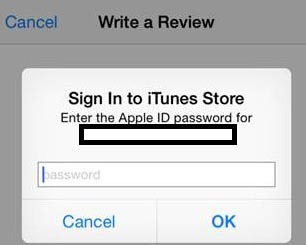 • Your Apple ID password - Required to sign-in to the iTunes Store to download apps or leave reviews. • Your Nickname – If you have never left a review in the past you will be able to create one, if you have done previously we will outline the steps to locate this. 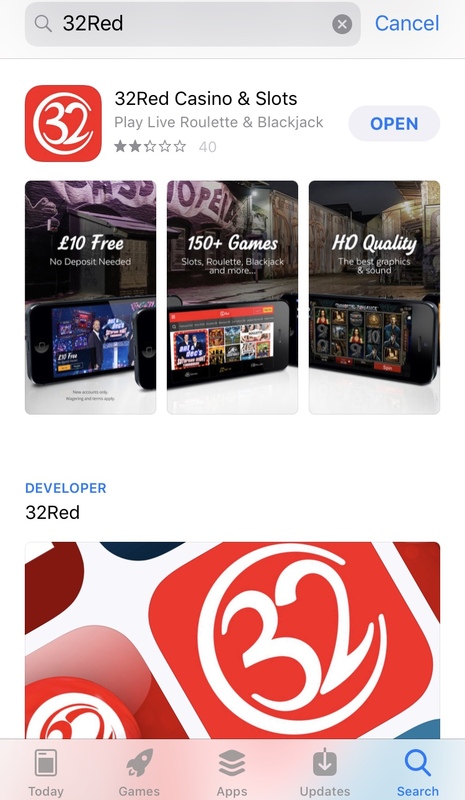 Navigate here to locate the 32Red Casino App on the App Store. 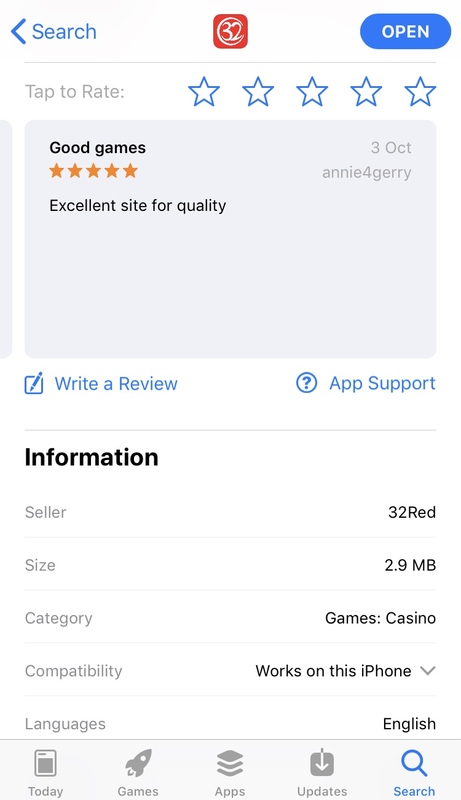 If you have the 32Red Casino App installed, you’ll be able to leave a review. If you don’t, you’ll need to download it first. You’ll be able to do this by hitting ‘Get’ on the page. Hit the ‘Reviews’ tab and you’ll see the option to ‘Write a Review’. Once clicked, you may be prompted to enter your Apple ID password. Enter this, and you’ll then be displayed the page allowing you to rate and review our App! From here, you can leave a star rating, title and review (optional – although we like to hear your feedback!). 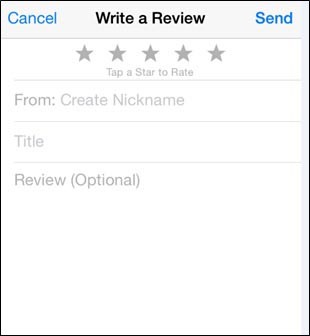 You’ll also be given the chance to create a nickname if this is your first time leaving a review on any app. We suggest the nickname is unique to you and has no relevance to 32Red/this promotion. Once you have chosen your nickname that will be your default one going forward – be creative as most will already have been taken! And that’s it! You will have left a review/rating on our 32Red Casino App and will be able to leave your nickname on the opt-in page to qualify. There can often be a delay in the reviews being processed by Apple, so we will look to credit you within 48 hours once the review has appeared in the App Store. 5) I don’t know my nickname… Help! Launch iTunes on your computer and sign-in to your account. From the settings there you should be able to create or edit your nickname. Wait for your review to appear and your nickname will be shown alongside it. You’ll then have this to hand to opt-in to the promotion. Free games will be credited within 48 hours once the review has appeared in the App Store, and the nickname has been submitted. Terms and conditions apply. The App Review Free Games promotion is only open to real money players invited by email or SMS. Unless invited, free games will not be credited even if a player has qualified for the promotion. To qualify, players must login to their 32Red account and then submit their App Store nickname used for the review, if the nickname associated with their 32Red account is incorrect or different on the App Store games will not be credited. Free games will be credited within 48 hours once the review has appeared in the App Store, and the nickname has been submitted.